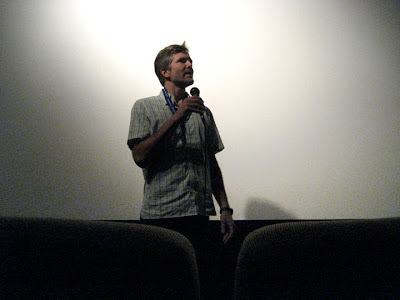 Filmmaker John David Allen on the festival circuit. 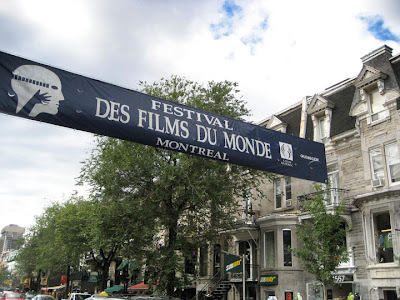 Montreal Worldfest, Aug 27 - Sept 7, 2009. Very impressed with the audiences here which were jam packed with serious film enthusiasts. We played before the Slovakian feature "Heaven Hell Earth", a story of a young woman who takes a ride from a stranger after an accident. Many overlapping themes -- which ends up being the case no matter what film we're paired with. After films the Quebec audiences can be found in nearby cafes and Pho restaurants endlessly discussing what they've seen, making notes in their programs, planning their next screenings. Gentle, civilized, French. And very welcoming. My first trip to Montreal, it felt like Paris transported to N America, which I suppose is what it is. After our four screenings and Q&A's Kelly and I headed for Quebec City. Next Fests will be Cambridge UK to be attended by Madeleine Potter, and Sidewalk Moving Picture Festival in Alabama. Then Woodstock, New Orleans, Williamstown and Savannah. John David Allen is a NYC-based filmmaker and editor. He has edited five Merchant Ivory films, including THE GOLDEN BOWL, LE DIVORCE, THE WHITE COUNTESS and the soon-to-be-released CITY OF YOUR FINAL DESTINATION. He's also won awards for a number of his short films including MONA'S PETS, cited by Stephen Holden of the New York Times as the best short in a program which ran at New York's Film Forum in 1992. John is now in pre-production for his feature film OKEFENOKEE, set in the lush swampland of his native Georgia.